Awesome – Jane Talks Tech! So, if you haven’t heard, Windows 7 is being released to the general public on the 22nd of October. I was one of the lucky people selected by House Party to host a Windows 7 Launch Party. Yesterday, my party pack arrived and I got to work installing Windows 7 Ultimate on my HP dv9700t laptop. This laptop is over a year old and had a Vista windows experience index score of 5.0. It took ~ 1.5 hours to do a clean install of Windows 7 over my existing Vista Ultimate installation. I took some photographs and shot some video which I will upload when I have the spare time. For those new to the upgrading experience, I highly recommend backing up important data you may need like your browser bookmarks, work and personal files, et cetera. I completely forgot to back up my firefox bookmarks and as a result, I’ve lost over a months’ worth of painstakingly collected bookmark-data. Thankfully, my Roboform installation ensured that my passwords and login identities weren’t lost. My other backup plan was that I would be able to reinstall Carbonite (an online backup service) and possibly scrounge for my bookmarks there. However, according to a customer service agent I chatted with, Carbonite currently does not officially support Windows 7. Bummer. 2) Click on the C: drive and let it work. When the next box comes up, there should be a button for “clean system files”. 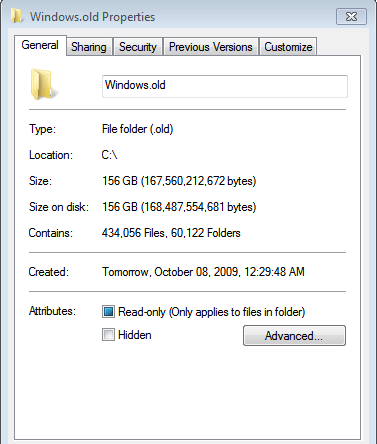 Oddly enough, according the properties of the Windows.old folder, the size displayed was 10GBs more. I need to call for help to find out where my hard disk space went!